Nigeria’s Inflation hits seven-month high at elven-point-four-four percent – Royal Times of Nigeria. 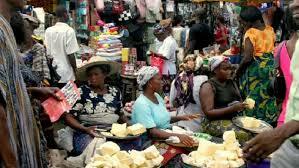 Nigeria’s consumer price index, which measures inflation, increased by eleven-point-four percent in December 2018; a zero-point-one-six percent increase from the eleven-point-two-eight percent recorded in November. According to the December 2018 Inflation report released by the National Bureau of Statistics today, all the divisions that contribute to the headline index increased. This is the first time in seven months that inflation would reach such levels. The last time the index was this high was in May 2018 when it was eleven-point-six-six percent. The urban inflation rate increased by eleven-point-seven percent in December 2018 from eleven-point-six percent recorded in November 2018, while the rural inflation rate increased by eleven-point-one percent in December 2018 from ten-point-nine percent in November 2018.